c100 for run and gun ninja ; practical? Re: c100 for run and gun ninja ; practical? Just did a run and gun the other day, used my 5D and a xf305. Got better footage and easier to use my 305, but did all the grab and go interviews on the 5D, and got the bulk of the footage with it. Why? Just easier to tote around. Got to say that thinking about the c100, it's a great idea, but still you have to manually change lenses, a lot (even with a zoom compared to xf305 since you have to go from about 35mm to 400). While it might *not* be a problem,it could be. I love the DOF of the 5D and the c100, but be aware of the issue of changing lenses. If that's not an issue, and you don't need stills, then the c100 is a great choice. I like that it has a 3.5 in mic jack, why? Because I've found that in many run and gun situations, I can plug in a 3.5 in lav with a spring cord extender, and wire up an interviewee within seconds, without messing with radio signals, or worrying about their damn cell phones. It makes a great interview option. So if you don't need broadcast quality, I think the 100 is a fabulous option. Video with DOF shooting with an SLR form factor. Sort of the best of both worlds IMHO. Just to add my two cents, I've shot handheld with the C100/Ninja 2 during 6 production days over the last few weeks, and I feel quite confident running around with it. My major concerns about both the camera and recorder have been alleviated - nailing focus with the EVF is easy with slight adjustments, the batteries on the Ninja last forever, the HDMI hasn't caused me any problems yet. All together the form and weight make for pleasant handheld shooting without any kind of rig. It does add a layer of complication - for example I've been shooting 24p, and the Ninja needs a moment to recognize the frame rate before it's ready to record (the fact that it does this is taking away a layer of complication down the chain). Getting the camera and the recorder talking to each other takes maybe 5-10 seconds, and it's really no more complicated than setting your exposure or color balance. The Ninja has a quirk in that once it recognizes the signal it automatically starts recording, so you have to wait for it and tell it to stop (that's annoying Atomos!). Once you're set you just push the record button on the camera to start and stop recording. Figuring out exactly how to connect the recorder to the camera may take a little trial and error, and perhaps the purchase of a few things. I've settle on something simple, light, sturdy, and effective, (not an articulating arm), which cost me about $15. I can confirm that the internal recording is practically identical to the ProRes or DNXHD from the Ninja. In fact the only difference that jumps out is that the external recorder seems to bypass whatever internal noise reduction is going on. Talking about noise with this camera just seems silly. Do you have a picture of how you've mounted your Ninja2? "Figuring out exactly how to connect the recorder to the camera may take a little trial and error, and perhaps the purchase of a few things. I've settle on something simple, light, sturdy, and effective, (not an articulating arm), which cost me about $15." Sure. Here is a picture of the Ninja mounted and of the two pieces used to mount it. As I said, simple, light, and cheap. I'm not using the Ninja as a monitor most of the time, and for what it's worth I can stick focus much easier with the EVF than the Ninja with or without peaking. I've been using the shoulder strap, which I like a lot, and do do find the monitor useful sometimes when I have the camera dropped and hanging from my neck. My main goal has been to get the Ninja out of the way and attached so that I have confidence running around with it. I had been using an articulating arm, which is perfectly fine, but this is a bit lighter and the Ninja sits a little lower. 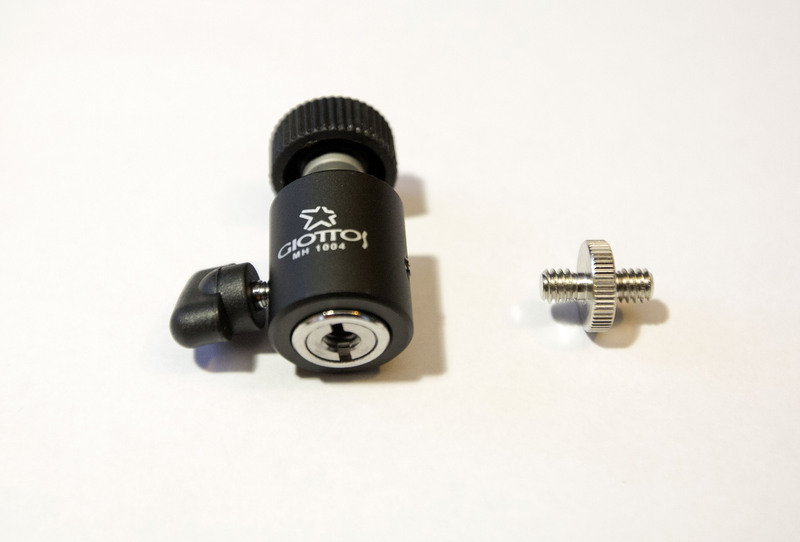 You could remove the handle, and use this to mount directly to to camera, although if you were so inclined you'd be better off swapping the male-to-male adapter with a hotshoe adapter.
) and ordered the 1/4" 20 male-to-male adapter from China, I think (http://www.bestofferbuy.com/14-inch-14-male-to-14-male-threaded-screw-adapter-p-69525.html). God info. 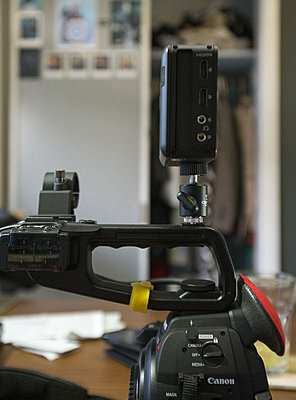 Just noticed Andrew, what eyecup attachment do you have on the C100s EVF? I have seen pictures of various types being (re)used on the web to improve it - so just curious! It's cheap and makes a huge difference in comfort and by blocking out light. It is a bit loose and can come off easily, if you're not careful. Definitely interested to look at other solutions for the EVF if you have any suggestions!